Description: Enter the world of a Korrigan, accompanied by his talking fairy companion. The pair are trapped in a dungeon and must escape back to their world by harnessing the power of light. 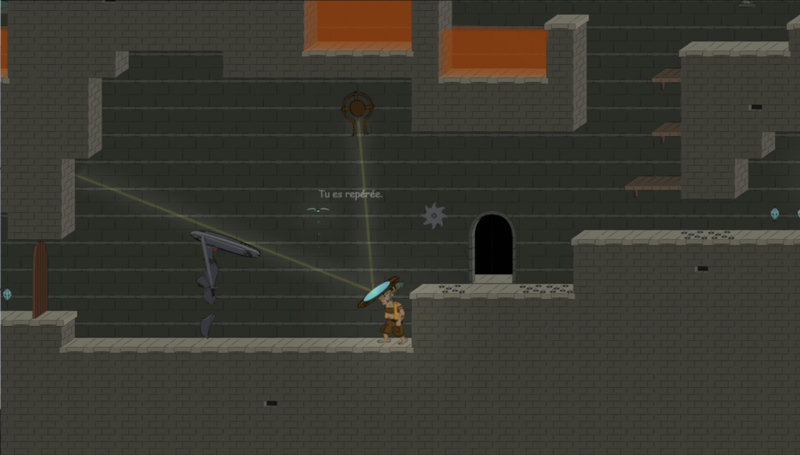 The Korrigan utilizes basic light reflection and refraction physics concepts in order to manipulate the light in the scene with his shield to complete puzzles as well as slay the dungeon’s guards. Skills and Ideas Taught: The principles of light travel, reflection and refraction, are taught through gameplay. After this game, the learner should be able to measure angles (of incidence, reflection and refraction) and to use the refraction law for simple calculations. Goal or Challenge: The goal is to get to the end of the dungeon in order to escape. To do so, the player gathers gemstones that will allow him/her to get new powers and to proceed further in the dungeon. Primary Audience: The primary audience of this game is constituted of 15 year-old students learning physics in high school. Assessment Approach: Completion of levels serves as the assessment of progress throughout the game. Proper utilization of the light reflection and refraction concepts allows players to progress through areas and complete levels. The more gemstones the player gets in each level, the more he/she should know about reflection/refraction calculations. Also, the further the player is able to go (in a reasonable number of attempts), the better he/she should have retained concepts.